Hong Kong Food Tour | Chicken Char Siu! So, you booked your Hong Kong tour and now are wondering: " If I was a foodie, where would I eat?" Well, don't look far, add our food tour to your Hong Kong activities! Try our Hong Kong culinary tours and have a delicious travel through the Cantonese kitchen. Although, in our exciting city we eat a lot of pork, we also have some delicious chicken char siu (chicken BBQ) or vegetarian food! Book your private food tours Hong Kong and let us plan an itinerary for your taste! Hong Kong Food Tour | Char Siu Anytime! ...Char what....? Char Siu or barbecued pork, to make it more simple, is a cooking method in the Cantonese kitchen and means literally "fork roasted". You can find this delicious speciality on Hong Kong culinary tours in "siu mei" restaurants. These places are specialised in meat dishes. On your private food tours Hong Kong, you will not only get some mouth-watering BBQ pork but also other meats like roasted goose or duck. Most shops display the meats by hanging them in the window. Usually, the food is served with a side of rice and vegetables. Should you get hungry on your Hong Kong tour or plan your Hong Kong activities, you should not miss out on barbecued pork! When you book Hong Kong culinary tours with us, we not only take you on a tasting journey across Hong Kong, we also talk about anything food related. For example, you will learn why some bird's nests are red and what fish maw is used for. Your Hong Kong food tour is full of information on traditional Chinese medicine. 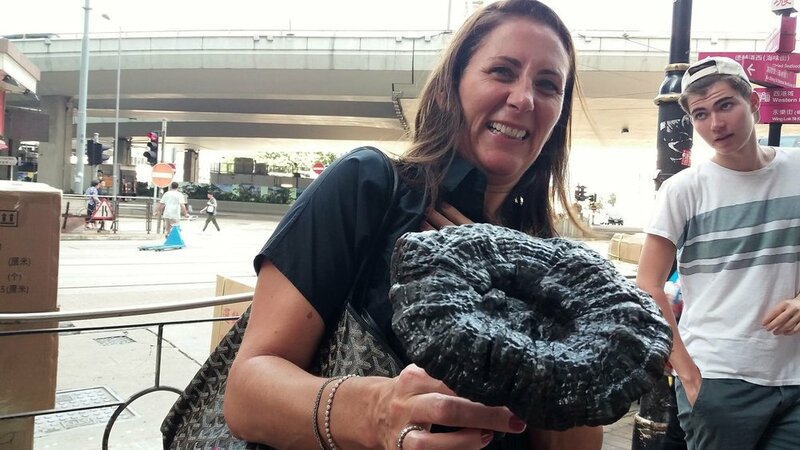 Your Hong Kong food guide will also tell you why this huge mushroom is called the "Mushroom of immortality". Our Hong Kong culinary tours are available as small group tours and as private food tours Hong Kong.